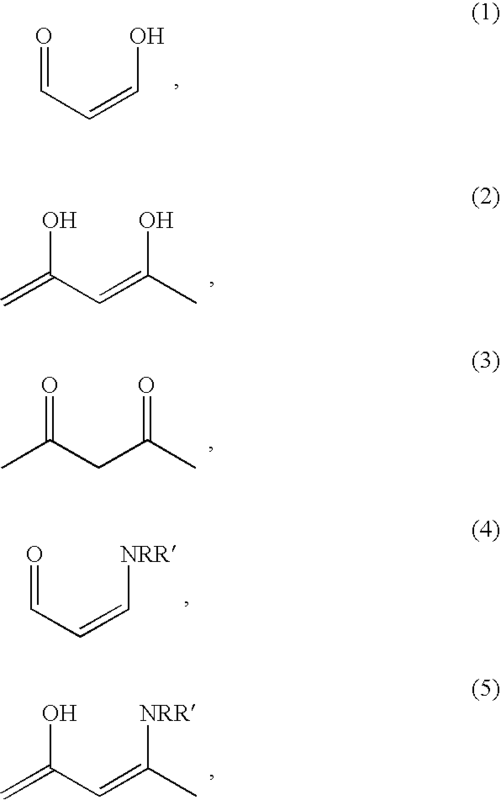 Dyes containing salicylate (6, R═OH), Salicamide (6, R═NH2, NHAr, NHAlk), or BON acid (3-hydroxy-2-naphthoic acid) (7, R═OH) or a nitrogenous BON acid derivative (7, R═NH2, NHAr, NHAlk) moiety as shown below may also be used in accordance with the present invention. These dyes often fall into the Colour Index Mordant application class. Dyes based upon Chromotropic acid 8 are also substantive to alumina. Azo dyes are formed when chromotropic acid is reacted with a diazonium salt. Azo coupling occurs at positions 2 and/or 7. Various co-solvents may also be included in the ink formulation. Examples of such co-solvents include a lactam such as N-methyl pyrrolidone. However, other examples of optional co-solvents include N-methylacetamide, N-methylmorpholine-N-oxide, N,N-dimethylacetamide, N-methyl formamide, propyleneglycolmonomethylether, tetramethylene sulfone, and tripropyleneglycolmonomethylether. 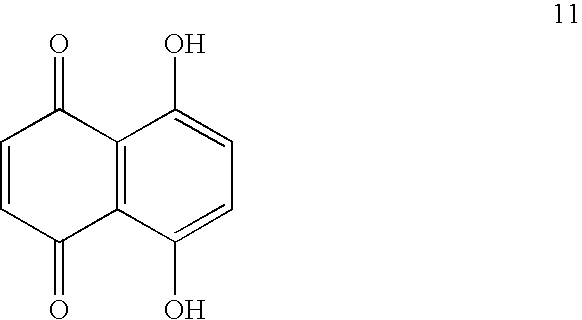 Still other solvents which may be used include propylene glycol and triethanolamine (TEA). If an acetamide-based cosolvent is also included in the formulation it is typically present at about 5 percent by weight, within a range of between about 1.0-12 percent by weight. Optionally, one or more humectants in an amount between about 0.5 and 20 percent by weight may be included in the ink formula. Additional humectants for optional use in the formulation include, but are not limited to, ethylene glycol, diethylene glycol, glycerine, and polyethylene glycol 200, 400, and 600, propane 1,3 diol, other glycols, a propyleneglycolmonomethyl ether, such as Dowanol PM (Gallade Chemical Inc., Santa Ana, Calif.), polyhydric alcohols, or combinations thereof. If a biocide or biostat is added to the ink formulation, it may be exemplified by Proxel GXL (Zeneca Corporation, Wilmington, Del.). Other examples include Bioban DXN (Angus Chemical Company, Buffalo Grove, Ill.). If a corrosion inhibitor is added to the formulation, it may be exemplified by Cobratec (PMC Specialty Group Distributing of Cincinnati, Ohio). Alternate corrosion inhibitors include sodium nitrite, triethanolamine phosphate, and n-acyl sarcosine. Still other examples include benzotriazole (Aldrich Chemical Company, Milwaukee, Wis.). If a surfactant is included in the formulation, it is typically a nonionic surfactant exemplified by Surfynol 504 (Air Products and Chemicals, Inc., Allentown, Pa.). Still other examples include Surfynol 465, and Dynol 6.04 also available from Air Products. If a chelating agent is included in the formulation it may be exemplified by an ethylene diaminetetraacetic acid (EDTA). Other additives such as pH stabilizers/buffers, (such as citric acid and acetic acid as well as alkali metal salts derived therefrom), viscosity modifiers, and defoaming agents such as Surfynol DF-65, may also be included in the formulation, depending on the product application. Aluminasol 200 (Nissan Chemical America, 2 g) was diluted with DI water (98 g) with good stirring. 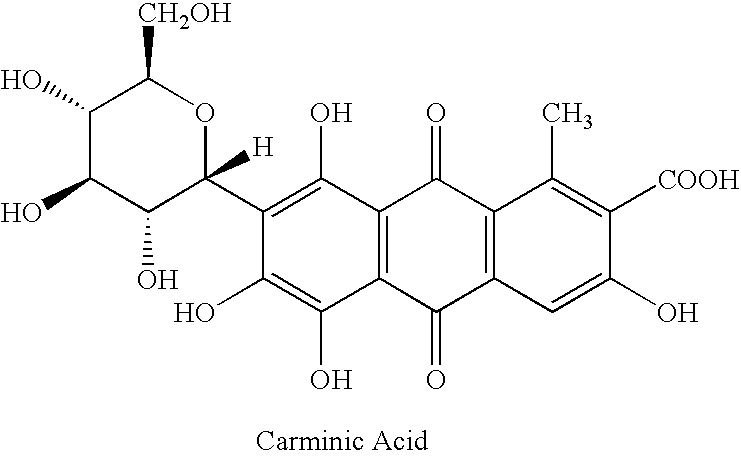 Carminic acid (Aldrich, #22,925-3) (0.5011 g) was suspended in DI water (23.7135 g) with good stirring. The carminic acid did not dissolve completely at this concentration, and so whenever portions were taken, they were taken while stirring vigorously so that suspended solids were also withdrawn. A hypodermic syringe was used to withdraw 1 ml of carminic acid suspension. This was added to the diluted Aluminasol 200 with good stirring. The suspension changed from a white to a bluish red. SNOWTEX-AK Size: 62 nm and Zeta Potential: +36 mV. SNOWTEX-AK Size: 83 nm and Zeta Potential: +35 mV. The above “ink” solution was applied to 4″×4″ pieces of untreated cotton fabric and allowed to air-dry. A similar control sample was constructed using only carminic acid. The dried fabrics were then subjected to a washing cycle in 2 liters of water containing Ajax liquid detergent and sodium bicarbonate at 60° C. for 2 hours. The fabric samples were then air-dried. The SNOWTEX-AK/carminic acid sample did not loose any color after the washing cycle. In contrast, the control sample (a sample stained with 0.2 g Carminic Acid in 50 ml water, dried under the same conditions) lost all of the color upon washing under the same conditions. 2. An article as defined in claim 1, wherein the functional compound comprises a colorant, a UV absorber, a pharmaceutical, an odor control agent, a fragrance, a therapeutic agent, a nutriceutical agent, an anti-bacterial agent, an anti-microbial agent, an anti-viral agent, a xenobiotic, or combinations thereof. 3. An article as defined in claim 1, wherein the particle containing alumina bonded to the functional compound has an average dimension of less than 1 mm. 4. An article as defined in claim 1, wherein the particle containing alumina bonded to the functional compound has an average dimension of less than 1,000 nm. 5. An article as defined in claim 1, wherein the functional compound comprises hydrocortisone, ascorbic acid, or aspartame. 6. An article as defined in claim 1, wherein the functional compound comprises tetracycline. 7. An article as defined in claim 1, wherein the particle containing alumina bonded to the functional compound has a zeta potential of at least 20 mV. 8. An article as defined in claim 1, wherein the plurality of particles are contained within a liquid vehicle when applied to the nonwoven material. 9. An article as defined in claim 1, wherein the functional compound comprises a dye. 10. An article as defined in claim 1, wherein the nonwoven material is subjected to a corona treatment prior to bonding with the plurality of positively charges particles. 11. An article as defined in claim 1, wherein the nonwoven material is subjected to an electret treatment prior to bonding with the plurality of positively charges particles. 12. An article as defined in claim 1, wherein the article has been exposed to microwave radiation or radio frequency radiation after the nonwoven material and the plurality of charged particles have been bonded together. 13. An article as defined in claim 9, wherein the dye contains an anthraquinone chromophore. 14. 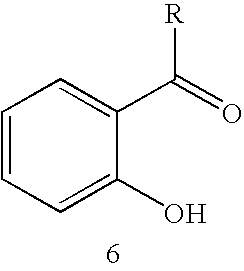 An article as defined in claim 9, wherein the dye contains salicylate or 3-hydroxy-2-naphthoic acid moieties. 15. An article as defined in claim 9, wherein the dye is based on chromotropic acid. 16. 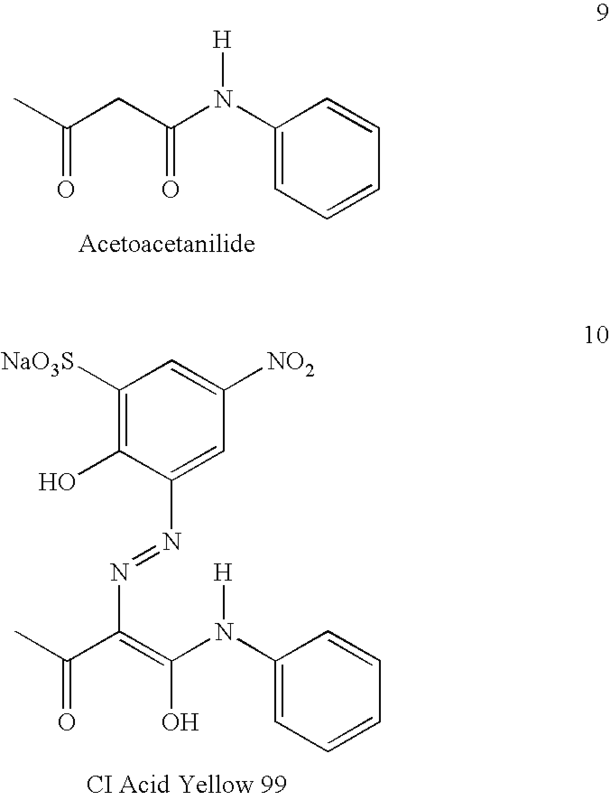 An article as defined in claim 9, wherein the dye contains an acetoacetanilide. 17. 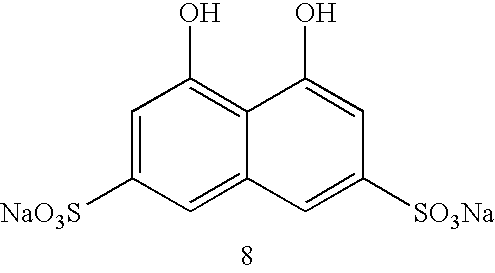 An article as defined in claim 9, wherein the dye contains a naphthoquinone. and wherein R and R′ are hydrogen. 21. An article as defined in claim 9, wherein the plurality of particles have an average dimension of less than 1,000 nm. 22. An article as defined in claim 1, wherein the receiving surface of the nonwoven material and the particles have a surface charge difference of at least 42 mV. 23. An article as defined in claim 1, wherein the receiving surface of the nonwoven material and the particles have a surface charge difference of at least 42 mV. 25. An article as defined in claim 24, wherein the particle comprises a core material coated with alumina. 26. An article as defined in claim 25, wherein the core material comprises silica. 27. An article as defined in claim 24, wherein the functional compound comprises a colorant, a UV absorber, a pharmaceutical, an odor control agent, a fragrance, a therapeutic agent, a nutriceutical agent, an anti-bacterial agent, an anti-microbial agent, an anti-viral agent, a xenobiotic, or combinations thereof. 28. An article as defined in claim 24, wherein the particle containing alumina bonded to the functional compound has an average dimension of less than 1 mm. 29. An article as defined in claim 24, wherein the particle containing alumina bonded to the functional compound has an average dimension of less than 1,000 nm. 30. An article as defined in claim 24, wherein the functional compound comprises hydrocortisone, ascorbic acid, or aspartame. 31. An article as defined in claim 24, wherein the functional compound comprises tetracycline. 32. An article as defined in claim 24, wherein the particle containing alumina bonded to the functional compound has a zeta potential of at least 20 mV. 33. An article as defined in claim 24, wherein the plurality of particles are contained within a liquid vehicle when applied to the spunbond fabric. 34. 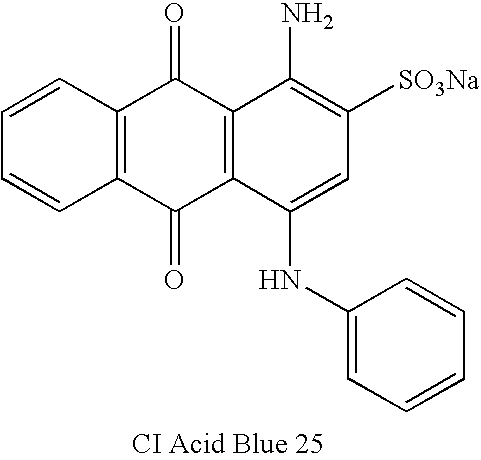 An article as defined in claim 24, wherein the functional compound comprises a dye. 35. An article as defined in claim 34, wherein the dye contains an anthraquinone chromophore. 36. An article as defined in claim 34, wherein the dye contains salicylate or 3-hydroxy-2-naphthoic acid moieties. 37. 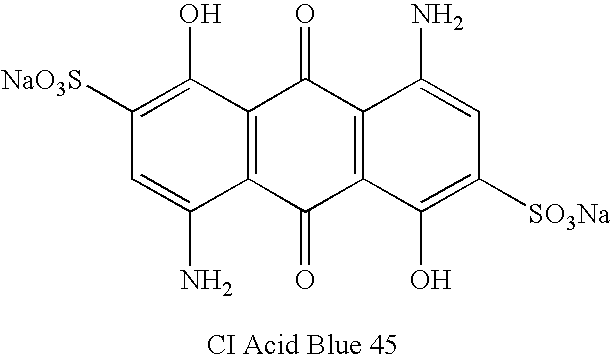 An article as defined in claim 34, wherein the dye is based on chromotropic acid. 38. An article as defined in claim 34, wherein the dye contains an acetoacetanilide. 39. 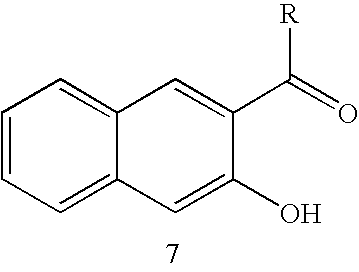 An article as defined in claim 34, wherein the dye contains a naphthoquinone. 43. An article as defined in claim 24, wherein the plurality of particles have an average dimension of less than 1,000 nm. 44. An article as defined in claim 24, wherein the receiving surface of the spunbond fabric and the particles have a surface charge difference of at least 42 mV. 45. An article as defined in claim 24, wherein the receiving surface of the spunbond fabric and the particles have a surface charge difference of at least 42 mV. Abstract of Japanese Patent JP56143272, Nov. 7, 1981. Abstract of Japanese Patent JP63105078, May 10, 1988. Abstract of Japanese Patent JP8259868, Oct. 8, 1996. Article-Ammonia vapour in the mouth as a diagnostic marker for Helicobacter pylori infection: preliminary "proof of principle" pharmacological investigations, C. D. R. Dunn, M. Black, D. C., Cowell, C. Penault, N. M. Ratcliffe, R. Spence, and C. Teare, British Journal of Biomedical Science, vol. 58, 2001, pp. 66-76. Article—Ammonia vapour in the mouth as a diagnostic marker for Helicobacter pylori infection: preliminary "proof of principle" pharmacological investigations, C. D. R. Dunn, M. Black, D. C., Cowell, C. Penault, N. M. Ratcliffe, R. Spence, and C. Teare, British Journal of Biomedical Science, vol. 58, 2001, pp. 66-76. Article-Nanoparticles Based on Polyelectrolyte Complexes: Effect of Structure and Net Charge on the Sorption Capability for Solved Organic Molecules, H. M. Buchhammer, G. Petzold, and K. Lunkwitz, Colloid Polym. Sci., vol. 278, No. 9, Sep. 2000, pp. 841-847. Article—Nanoparticles Based on Polyelectrolyte Complexes: Effect of Structure and Net Charge on the Sorption Capability for Solved Organic Molecules, H. M. Buchhammer, G. Petzold, and K. Lunkwitz, Colloid Polym. Sci., vol. 278, No. 9, Sep. 2000, pp. 841-847. Article-Uniform Deposition of Ultrathin Polymer Films on the Surfaces of Al2O3 Nanoparticles by a Plasma Treatment, Donglu Shi, S. X. Want, Jim J. van Ooij, L. M. Wang, Jiangang Zhao, and Zhou Yu, Jun. 2000, 15 pages. Article—Uniform Deposition of Ultrathin Polymer Films on the Surfaces of Al2O3 Nanoparticles by a Plasma Treatment, Donglu Shi, S. X. Want, Jim J. van Ooij, L. M. Wang, Jiangang Zhao, and Zhou Yu, Jun. 2000, 15 pages. Product Information on Snowtex®, 6 pages.